Founder of Christian monasticism. The chief source of information on St. Anthony is a Greek Life attributed to St. Athanasius (ca. 296-373). Anthony was born at Coma, near Heracleopolis Magna in Fayum, about the middle of the third century. He was the son of well-to-do parents, and on their death, in his twentieth year, he inherited their possessions. He had a desire to imitate the life of the Apostles and the early Christians, and one day, on hearing in the church the Gospel words, "If thou wilt be perfect, go and sell all thou hast", he received them as spoken to himself, disposed of all his property and goods, and devoted himself exclusively to religious exercises. Long before this it had been usual for Christians to practice asceticism, abstain from marriage and exercising themselves in self-denial, fasting, prayer, and works of piety; but this they had done in the midst of their families, and without leaving house or home. Later on, in Egypt, such ascetics lived in huts, in the outskirts of the towns and villages, and this was the common practice about 270, when Anthony withdrew from the world. He began his career by practising the ascetical life in this fashion without leaving his native place. He used to visit the various ascetics, study their lives, and try to learn from each of them the virtue in which he seemed to excel. Then he took up his abode in one of the tombs, near his native village, and there it was that the Life records those strange conflicts with demons in the shape of wild beasts, who inflicted blows upon him, and sometimes left him nearly dead. After fifteen years of this life, at the age of thirty-five, Anthony determined to withdraw from the habitations of men and retire in absolute solitude. He crossed the Nile, and on a mountain near the east bank, then called Pispir, now Der el Memum, he found an old fort into which he shut himself, and lived there for twenty years without seeing the face of man, food being thrown to him over the wall. He was at times visited by pilgrims, whom he refused to see; but gradually a number of would-be disciples established themselves in caves and in huts around the mountain, Thus a colony of ascetics was formed, who begged Anthony to come forth and be their guide in the spiritual life. At length, about the year 305, he yielded to their importunities an emerged from his retreat, and, to the surprise of all, he appeared to be as when he had gone in, not emaciated, but vigorous in body and mind. For five or six years he devoted himself to the instruction and organization of the great body of monks that had grown up around him; but then he once again withdrew into the inner desert that lay between the Nile and the Red Sea, near the shore of which he fixed his abode on a mountain where still stands the monastery that bears his name, Der Mar Antonios. Here he spent the last forty-five years of his life, in a seclusion, not so strict as Pispir, for he freely saw those who came to visit him, and he used to cross the desert to Pispir with considerable frequency. The Life says that on two occasions he went to Alexandria, once after he came forth from the fort at Pispir, to strengthen the Christian martyrs in the persecution of 311, and once at the close of his life (c. 350), to preach against the Arians. The Life says he died at the age of a hundred and five, and St. Jerome places his death in 356-357. All the chronology is based on the hypothesis that this date and the figures in the Life are correct. At his own request his grave was kept secret by the two disciples who buried him, lest his body should become an object of reverence. Of his writings, the most authentic formulation of his teaching is without doubt that which is contained in the various sayings and discourses put into his mouth in the Life, especially the long ascetic sermons (16-43) spoken on his coming forth from the fort at Pispir. It is an instruction on the duties of the spiritual life, in which the warfare with demons occupies the chief place. Though probably not an actual discourse spoken on any single occasion, it can hardly be a mere invention of the biographer, and doubtless reproduces St. Anthony's actual doctrine, brought together and co-ordinated. It is likely that many of the sayings attributed to him in the "Apophthegmata" really go back to him, and the same may be said of the stories told of him in Cassian and Palladius. There is a homogeneity about these records, and a certain dignity and spiritual elevation that seem to mark them with the stamp of truth, and to justify the belief that the picture they give us of St Anthony's personality, character, and teaching is essentially authentic. A different verdict has to be passed on the writings that go under his name, to be found in P.G., XL. The Sermons and twenty Epistles from the Arabic are by common consent pronounced wholly spurious. St. Jerome (Illustrious Men 88) knew seven epistles translated from the Coptic into Greek; the Greek appears to be lost, but a Latin version exists (ibid. ), and Coptic fragments exist of three of these letters, agreeing closely with the Latin; they may be authentic, but it would be premature to decide. Better is the position of a Greek letter to Theodore, preserved in the "Epistola Ammonis ad Theophilum", sect. 20, and said to be a translation of a Coptic original; there seems to be no sufficient ground for doubting that it really was written by Anthony (see Butler, Lausiac History of Palladius, Part I, 223). The authorities are agreed that St. Anthony knew no Greek and spoke only Coptic. 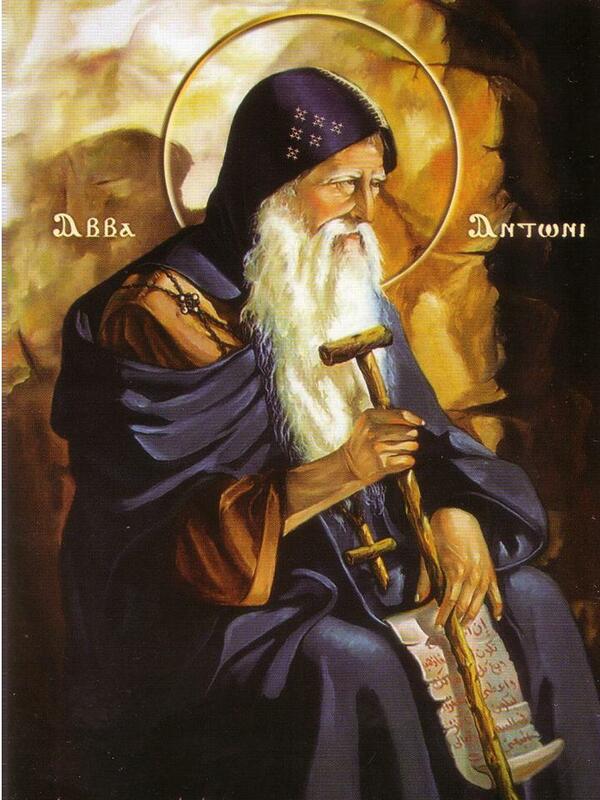 There exists a monastic Rule that bears St. Anthony's name, preserved in Latin and Arabic forms (P.G., XL, 1065). While it cannot be received as having been actually composed by Anthony, it probably in large measure goes back to him, being for the most part made up out of the utterances attributed to him in the Life and the "Apophthegmata"; it contains, however, an element derived from the spuria and also from the "Pachomian Rules". It was compiled at an early date, and had a great vogue in Egypt and the East. At this day it is the rule followed by the Uniat Monks of Syria and Armenia, of whom the Maronites, with sixty monasteries and 1,100 monks, are the most important; it is followed also by the scanty remnants of Coptic monachism. It will be proper to define St. Anthony's place, and to explain his influence in the history of Christian monachism. He probably was not the first Christian hermit; it is more reasonable to believe that, however little historical St. Jerome's "Vita Pauli" may be, some kernel of fact underlies the story (Butler, op. cit., Part I, 231, 232), but Paul's existence was wholly unknown unknown till long after Anthony has become the recognized leader of Christian hermits. Nor was St. Anthony a great legislator and organizer of monks, like his younger contemporary Pachomius; for, though Pachomius's first foundations were probably some ten or fifteen years later than Anthony's coming forth from his retreat at Pispir, it cannot be shown that Pachomius was directly influenced by Anthony, indeed his institute ran on quite different lines. And yet it is abundantly evident that from the middle of the fourth century throughout Egypt, as elsewhere, and among the Pachomian monks themselves, St. Anthony was looked upon as the founder and father of Christian monachism. This great position was no doubt due to his commanding personality and high character, qualities that stand out clearly in all the records of him that have come down. The best study of his character is Newman's in the "Church of the Fathers" (reprinted in "Historical Sketches"). The following is his estimate: "His doctrine surely was pure and unimpeachable; and his temper is high and heavenly, without cowardice, without gloom, without formality, without self-complacency. Superstition is abject and crouching, it is full of thoughts of guilt; it distrusts God, and dreads the powers of evil. Anthony at least had nothing of this, being full of confidence, divine peace, cheerfulness, and valorousness, be he (as some men may judge) ever so much an enthusiast" (op. cit., Anthony in Conflict). Full of enthusiasm he was, but it did not make him fanatical or morose; his urbanity and gentleness, his moderation and sense stand out in many of the stories related of him. Abbot Moses in Cassian (Coll. II) says he had heard Anthony maintaining that of all virtues discretion was the most essential for attaining perfection; and the little known story of Eulogius and the Cripple, preserved in the Lausiac History (xxi), illustrates the kind of advice and direction he gave to those who sought his guidance. The monasticism established under St. Anthony's direct influence became the norm in Northern Egypt, from Lycopolis (Asyut) to the Mediterranean. In contradistinction to the fully coenobitical system, established by Pachomius in the South, it continued to be of a semi-eremetical character, the monks living commonly in separate cells or huts, and coming together only occasionally for church services; they were left very much to their own devices, and the life they lived was not a community life according to rule, as now understood (see Butler, op. cit., Part I, 233-238). This was the form of monastic life in the deserts of Nitria and Scete, as portrayed by Palladius and Cassian. Such groups of semi-independent hermitages were later on called Lauras, and have always existed in the East alongside of the Basilian monasteries; in the West St. Anthony's monachism is in some measure represented by the Carthusians. Such was St. Anthony's life and character, and such his role in Christian history. He is justly recognized as the father not only of monasticism, strictly so called, but of the technical religious life in every shape and form. Few names have exercised on the human race an influence more deep and lasting, more widespread, or on the whole more beneficent. and to follow in the footsteps of Our Lord Jesus Christ.